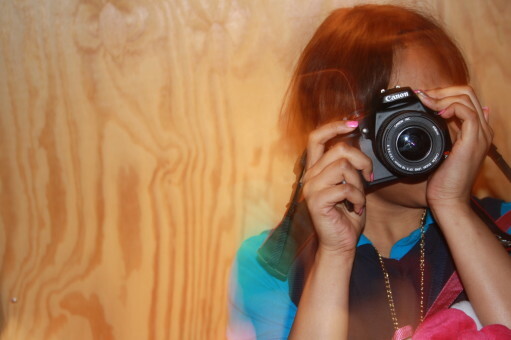 MAKESHOP » Remaking an Image: Digital Photography with YouthALIVE! 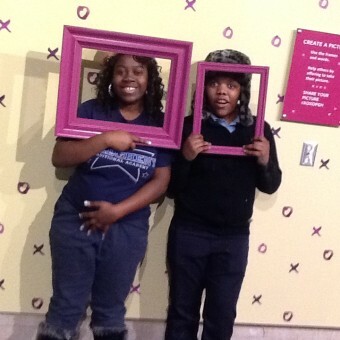 Remaking an Image: Digital Photography with YouthALIVE! Every Tuesday, Wednesday, and Thursday, about a dozen local middle school students head to MAKESHOP, where they’re greeted with a bowl of apples, oranges, and bananas. School is over for the day, and the students eagerly grab a piece of fruit to recharge before settling in to an hour-long YouthALIVE! (that is, Youth Achievement through Learning Involvement, Volunteering and Employment!) session. Since I joined the MAKESHOP team in November, YA! activities have included e-textiles, leather punching, woodblock carving, quilting, and mallet making. Most recently, YA! moved on to something that took them out of the workshop, all over and outside the Museum: digital photography. First, the YA! 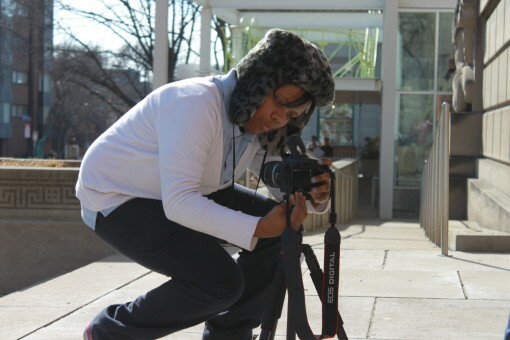 students learned a little about digital single-lens reflex cameras (DSLRs), which are a larger and offer more features than a camera phone or the kind of camera you can stick in your pocket. Then they experimented with different settings on the camera, learning to use the camera like a third eyeball. They adjusted manual focus (making the view through the camera fuzzy and clear), aperture (making the hole in the lens, or camera eyeball, bigger and smaller), and shutter speed (changing how long the lens stays open to capture an image). Cameron models proper tripod use. Next, the YA! students explored different projects to use cameras on their own. They went on photo scavenger hunts around the Museum, captured their reflections in windows and in water, and began to edit their photos in Photoshop, a computer program. An iPad photo taken in XOXO. Some of the things the students had to capture on the scavenger hunt included things like “each person on your team posing with a picture frame” and “a view from above (also known as a ‘bird’s-eye view’ or a ‘high-angle shot’).” They used iPad cameras, which produce a lower quality image than the DSLRs. When we moved on to reflections, the main challenge was to take a picture without using the automatic settings on the camera. 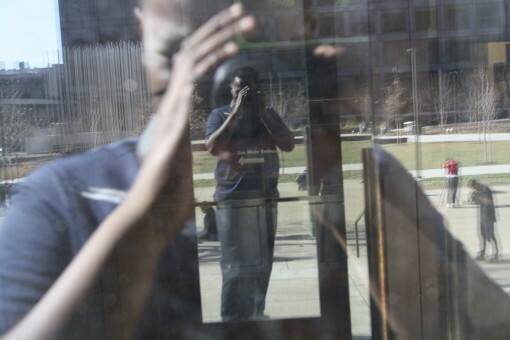 In order to take a photo of a reflection, the camera can’t produce a flash of light because it would get in the way of the reflection. Cameras automatically flash light when they sense that they need more light to take a clear picture. By changing the aperture and shutter speed, you can let more light into the camera’s lens so that you won’t need a flash to be able to capture what’s in front of you. With a flash, you would see a circle of light instead of the full reflection in this window. Finally, the students got to use some advanced editing techniques to change the way their pictures looked once they were uploaded to a computer from their cameras. Photoshop has some really cool features, one of which is the ability to combine lots of photos into one big photo. Once the students had a bunch of photos they could patch together digitally, they used the Photomerge command to stitch them together to make a panorama. Once students combined 12 images into one big image, they used advanced digital tools to add fake objects to their images without them looking fake. One group’s edit looked like this. Can you spot some of the differences, and see what fake things the students added? Molly joined the MAKESHOP team in November 2013.